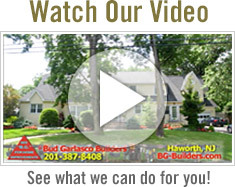 Since 1976, Bud Garlasco Builders has been providing Northern New Jersey with the finest in residential and commercial construction and improvements, having successfully completed hundreds of small to large scale projects over three decades. Our team consists of skilled craftsmen, seasoned project managers and experienced field supervisors. Whether you want to do a minor renovation, a major addition, or build a new home or place of business, Bud Garlasco and his team is the source for all your improvement and construction needs. Contact BG Builders with your ideas or plans and let us turn them into reality. © 2017 Bud Garlasco Builders, All Rights Reserved.